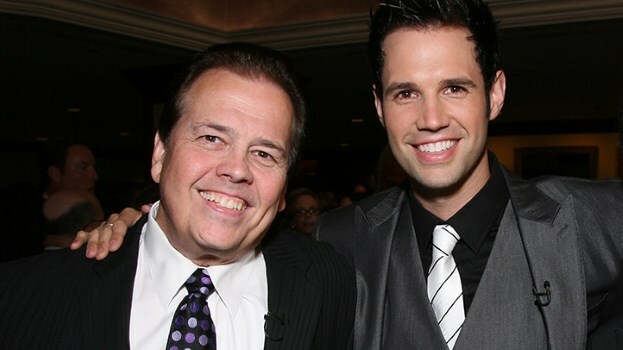 Alan Osmond and his son David have both been honored with the National Multiple Sclerosis Society Spirit of Life Award. Charisma and musicality aren’t the only things David Osmond has in common with his father, Alan Osmond, a founding member of the iconic 1970s musical group The Osmonds. Both men live with forms of multiple sclerosis (MS). Alan Osmond has primary-progressive multiple sclerosis, a less-common type of MS that causes a gradual worsening of neurological functioning, typically leading to significant physical disability and reduced mobility. But because his symptoms didn’t resemble his father’s, David didn’t associate them with MS. Instead, he brushed off the pain, blaming it on exhaustion. Soon, however, ignoring his symptoms was no longer an option: His eyesight quickly worsened, and he eventually felt pain throughout his body. “I started tipping over,” he says. “I couldn’t play guitar any more, and my voice struggled.” Before long, David was unable to move from the chest down and needed to use a wheelchair to get around. After several tests and misdiagnoses, David was diagnosed in 2006 with relapsing-remitting multiple sclerosis, the most common form of MS. He was 26. “I didn’t believe it, because I thought, ‘How could I be worse off than my dad in a matter of months than he was in decades?’ The last thing on my mind was multiple sclerosis of any kind,” says David. David took the steroid for a week and then was presented with a series of other treatment options. However, his fear of needles kept him from going forward with any of them, and instead he chose to make lifestyle changes such as diet modifications and supplementation. “At that time I felt that was enough. I was still coming to grips with the diagnosis and was kind of coasting and hoping for the best. I had about one to two relapses a year and just dealt with them,” he says. David’s perspective changed after his first child was born. “Treatment began to evolve as we started having our children, and I realized I had a lot to fight for. I wanted to be there for my kids,” says David. In 2010, the National Multiple Sclerosis Society presented David with the Spirit of Life Award. “I actually presented the same award to my dad 10 years previously, before I even had any MS symptoms. That night he presented it back to me. It was a night I’ll never forget, because I was there with my wife and our first baby girl,” says David. During the ceremony, David learned about the first oral disease-modifying drug for relapsing forms of MS, Gilenya (fingolimod). “There’s no question that wanting to be that dad on the floor wrestling with my kids changed my perspective and continues to motivate me to keep fighting,” he says. Being a father also makes David appreciate his dad even more. “He always said, ‘I may have MS, David, but MS does not have me.’ I’ve never heard him complain about what he goes through, and I know it’s hard, especially now that I live with my own form of MS. He has set the bar so high for me as a father. I want to be an example for my kids like he continues to be for me,” says David. Since starting drug therapy, David has been able to resume his career, and he says he has not had a relapse in two years. As lead singer of The Osmonds 2nd Generation, a band composed of Alan Osmond’s sons, David has performed before sold-out stadiums in more than 17 countries and has had three top 40 hits in the U.K. with the band. “Music is powerful. It’s how I express myself. I wanted to create a song to encourage people to fight — to not live in the shadows, but to raise their voices and become their own advocates. [I want them] to ask their doctors tough questions, and find out what the best course of action is for them,” he says. David has performed his song across the United States and recently sang it on stage with his aunt, Marie Osmond.